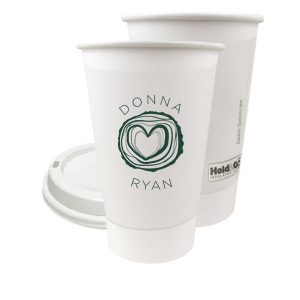 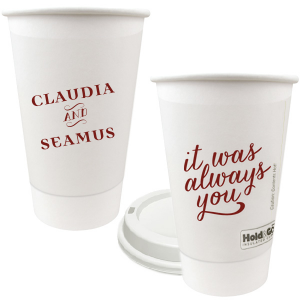 Personalized 16 oz paper coffee cups are the perfect recyclable to-go cups for parties and group events. Great for corporate events, outdoor parties and casual weddings, customize with your logo, favorite clip art or text for a drink accessory sure to impress. Lids included. Sip your coffee and tea in personalized style with custom designed 16 oz paper cups from For Your Party. 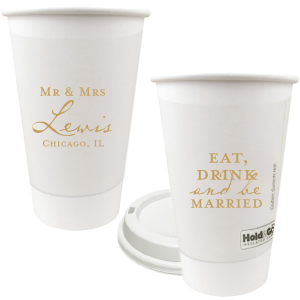 Your guests will love how your personalized 16 oz paper coffee cups coordinate with your party theme. Customized 16 oz paper coffee cups are a great addition to your wedding reception, bridal showers, dinner parties and many more occasions. 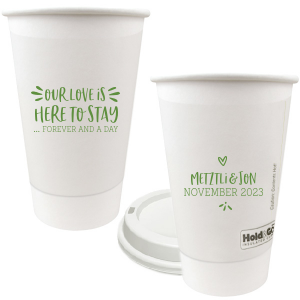 Browse the designs in our design idea galleries to find the perfect look for your personalized 16 oz paper coffee cups. Choose a boho feather design for a bridal luncheon, or opt for a classic single initial monogram or a simple “congrats” design- you have nearly endless options for your personalized 16 oz paper cups. With over 50 screen printing color options available, coordinating your custom 16 oz paper coffee cups with your event colorway is easy. 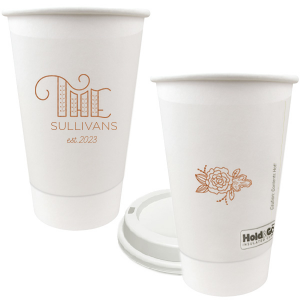 The lids are included with your 16 oz paper coffee cups, so your guests will have a to-go option. 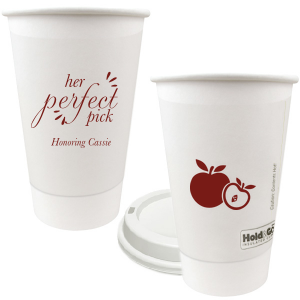 Get started designing the perfect personalized 16 oz paper cups today!